Version 3.5.0.1 of Fast Duplicate File Finder is released and available for download. Along with all the new features the new version provides improved support for the Windows 8 operating system. 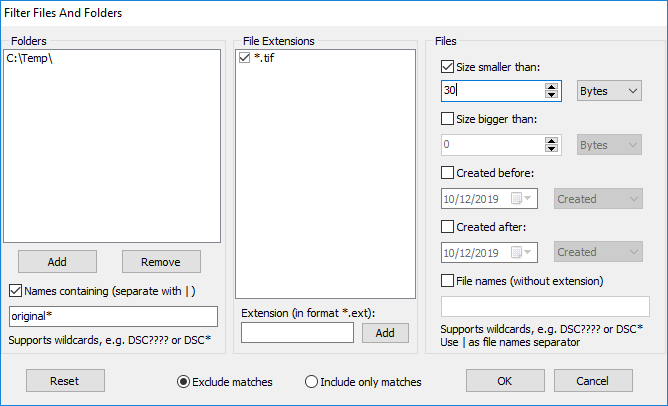 A major new feature in this release is the option to find duplicate or similar file names. Such feature is handy for identifying copies of the files with appended numbers or letters in order to denote versions. The “Similar File Names” mode will list for example all files named “My CV.doc”, “My CV 2.doc”, “My CV 2012.doc” and so on. You can control how close the matched names should be by specifying the similarity percent. Usually a setting of 95% works quite well. Another important option is added to the filter where now you can not only exclude certain types of files, but also include them . The new version will let you scan for example only for certain types of files like “*.jpg”, “*.exe” or a combination of them. There are also plenty of other filtering options that you can choose from. A lot of new features are included in this new release. One of them requested by our users is the “Check all except first in group” which is now available in the “Quick Check” dialog. A warning dialog is now displayed if you try to delete all the items in a duplicate group and it can be turned off via the application settings. Enhancements in the “Browse for folder” dialog will let you navigate to a location by pasting a path in the newly added location field. You can also easily copy the path of the selected folder. Project loading time is improved and file dates are now stored in the project file. You can easier review your projects on another machine. As always we will be glad to hear your opinion. What do you think about the new version? Do you have suggestions? Please drop us a line in the comments. This entry was posted in Fast Duplicate File Finder and tagged Find Duplcate Files Windows 8, Find Duplicate File Names, Find Duplicate Files, Find Duplicate Names, Find Duplicates Win8, Find Files, Find Similar File Names, Find Similar Names, Win 8 Duplicate Finder, Windows 8 Duplicate File Finder on December 15, 2012 by MindGems Support.